For the 54.4 million Americans with disabilities, the risk of being a victim of crime, especially a victim of sexual assault, is 4 to 10 times higher than those without disabilities. Research studies (Powers, 2004; Nosek, 2001; Sobsey, 1994; Petersilia, 1998; Waxman, 1991) consistently report that there is a very high rate of sexual violence against people with physical and cognitive disabilities, as well as, those with significant speech/communication disabilities. Compounding the physical and mental trauma of violence, crime victims with disabilities are less likely to seek medical attention and report the victimization to law enforcement due to limited access to the various aspects of the criminal justice system including domestic violence shelters. As a result, these crimes often go uninvestigated and are less likely to be prosecuted when they do go to court. Soulful Presence is engaged in a variety of programs regarding violence against individuals with disabilities including the development of the First Responder Disability Awareness Briefing Project, a series of four, 10 minute informational DVDs with accompanying guides to be distributed to 134 law enforcement agencies throughout New Mexico. individuals with mental illness who are victims of domestic violence, sexual assault, dating violence and stalking. Nosek, M.A., Foley, C.C., Hughes, R.B., Howland, C.A. (2001). 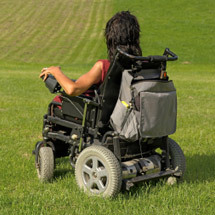 Vulnerabilities for Abuse Among Women with Disabilities. Sexuality and Disability, 19 (3), 177-190. Petersilia, J. (1998). Statement prepared for the California Senate Public Safety Committee Hearings on "Persons with Developmental Disabilities in the Criminal Justice System." Unpublished paper, January 15, 1998. Powers, L.E., Curry, M.A., Oschwald, M., Maley, S., Saxton, M. & Eckels, K. (2002, Jan.-March). Barriers and strategies in addressing abuse: A survey of disabled women’s experiences. Journal of Rehabilitation. Sobsey, D. (1994). Violence and Abuse in the Lives of People with Disabilities: The end of silent acceptance? Baltimore: Paul H. Brookes Publishing Company. Waxman, B.F. (1991). Hatred: the unacknowledged dimension in violence against disabled people. Sexuality and Disability, 9 (3), 185-198.